This project is awesome if a friend needs cheering up or if you need a birthday card! Select the floral sheet from the embossed cardstock stack. 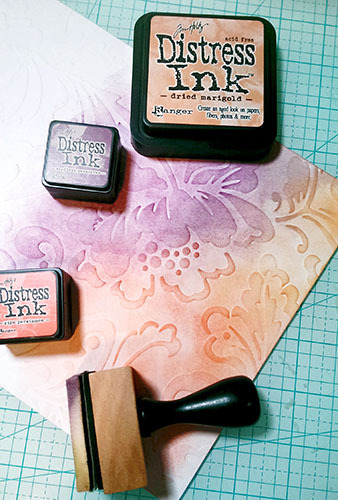 Using the distress inks, blend the colors into an 8”x8” area. Spritz some water on the paper; let it sit for a few seconds then blot with a paper towel. Repeat this again. With the blender tool and the same distress inks, lightly add more color to the sheet (lightly being the key so that the color only transfers to the raised design on the paper). This will give the paper a little more definition and make the print more visible. Set aside to dry. Cut a 7” x 10” piece from the solid cardstock sheet and fold it in half. Cut a piece from the embossed floral sheet to go on the front of the card (take off 1/4" from both the length and the width before adhering in place). Secure this piece to the card using glue or double-sided tape. 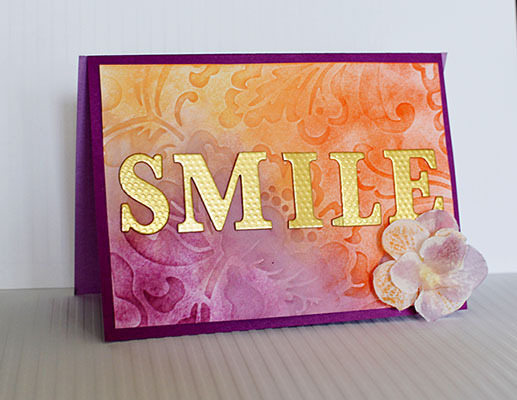 Grab some chipboard letters. Secure them to the card, centered horizontally (be sure to use a ruler to ensure they are applied straight). Add the flower to the bottom right corner of the card. Using a double-sided cardstock sheet for the card base? Trim 1/8” off the front on the card (3 sides only) to give it a 2-tone effect. Don’t have chipboard letters that are the right color? Spray paint them to match. Just be sure they are dry before handling them.